I always find myself making a lengthy list of books I want to read whether I am surfing Amazon.com or spending hours in Barnes & Noble. So I am sharing 3 books I want to read now, what health and fitness books are you loving? I want to know! Maria Menounos knows first hand what it takes to train your mind and change your body! She lost 40lbs (can you believe it?) and hasn't gained a pound back since. She shares her lasting weight-loss program based on the Mediterranean diet of her childhood that will encourage women to think “smarter, simpler, healthier”—a personal mantra that helped the star. 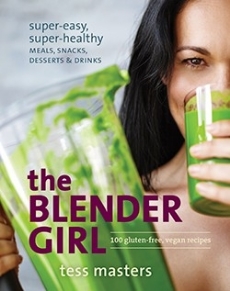 Blogger Tess Masters is behind theblendergirl.com, featuring 100 gluten-free, vegan recipes for smoothies, meals, all made quickly and easily in a blender. Need I say more? Perfect for on the go healthy meals. Packed with 150 plant-based, nutrient-dense, whole food recipes developed within the Thrive nutritional philosophy. Although I am not a vegan all the recipes are vegan and allergen-free (or with gluten-free options) to eliminate wheat, yeast, gluten, soy, refined sugar, and dairy from your diet. I love testing out all types of new and healthy exciting dishes. Options for healthy eating are endless! Make sure to sign up for my newsletter by visiting the homepage of Nadia Murdock Fit!